Embattled Rwandan presidential candidate Victoire Ingabire Umuhoza reported that officers of her FDU-Inkingi Party are being tortured in a Rwandan prison and that Kagame has now arrested and tortured Theogene Muhayeyezu, her Rwandan lawyer. 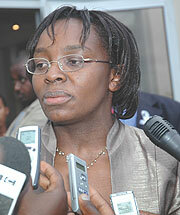 It seems that no lawyers, neither Rwandan nor foreign, will be able to defend Victoire Ingabire Umuhoza without themselves facing arrest by the Kagame regime, which arrested and incarcerated William and Mitchell Law Professor and international criminal lawyer Peter Erlinder for alleged “genocide ideology,” after he traveled to Rwanda to defend presidential candidate Ingabire against the same charge. “Genocide ideology” is a vague Rwandan statutory crime, which means disagreeing with the official history of the 1994 Rwanda Genocide, or, it often seems, disagreeing with the Kagame regime. Erlinder, is back in the United States, after three weeks incarceration in Kigali, speaking out about Rwandan President Paul Kagame, whom he accuses of ordering the political assassinations that triggered the Rwanda Genocide, costing a million Rwandan lives, then racketeering to control the mineral wealth of neighboring D.R. Congo, at a cost of more than six million more lives. Rwanda, Ingabire reported that officers of her FDU-Inkingi Party are being held and tortured in a Rwandan prison and that Kagame has now arrested and tortured the Rwandan lawyer who took Erlinder’s place. Umuvugizi journalist Jean Leonard Rugembage was gunned down outside his home on the day of last week’s arrests, right after reporting that Kagame had ordered the attempted assassination of Rwandan exile General Kayumba Nyamwasa in Johannesburg, South Africa. Rugembage’s Umuvugizi Editor, Jean Bosco Gasasira, who fled to Uganda, accuses Rwandan President Paul Kagame of using violence, assassination, arrest and torture to remain in power, and says that the US and UK arethe leading donors supporting his regime. Rwandan Police Chief Eric Kayiranga denied the allegations of torture and said that those who remain in prison are visited regularly because the prison does not provide food for them, which means that they have been getting food from those who visit them every day.